Reflecting the growing take-up to sailing the 420 Class across the USA and Canada, SAIL CORK, Canada's premier multi-class regatta will include the 420 at this year's event in Kingston, 13-17 August 2017. On 15 March 2017, CORK announced that the International 420 Class will be added to the class line-up at the CORK International Regatta this year. The I420 fleets are developing in the USA and Canada and inclusion in Canada's premier event is a natural progression. The Notice of Race will be posted on the CORK website shortly. 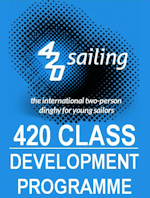 Recognizing the growth of the 420 Class in Canada, the International 420 Class Association is hosting a Clinic immediately prior to CORK, from 9-13 August 2017. CLICK HERE to find out more.